On this day in 1893 the Penzance Free Library at the top of Morrab Road was officially opened. At 7.00 pm, in a damp and murky twilight, the artillery band led the civic party down to the new building. Their “enthusiasm…. was not to be extinguished by a little moisture”. There was “coloured fire”; there were “many rows of streamers”. The bay window of the Science School next door (which would later be absorbed into the Library) was “gay with brilliant Chinese lanterns”. Mr Carne – standing in for the architect – handed the ceremonial key to Mayor Julyan. “His worship paid Mr. C. H. Benn (the librarian) a penny for the first yearly membership card issued, and took the first of the 4000 volumes from the shelves". What did he choose? Lockhart’s Ancient Spanish Ballads. We do not know whether this was the fine limited edition of 1841, or one of the more recent - and cheaper editions - available by 1893. It was a night intended to be remembered by Posterity. And to whom should Posterity direct its thanks? Applause for Mr Octavius Allen Ferris, deceased, of St Pancras. He had bequeathed nearly £10,000 for the establishment of free libraries in West Cornwall – nearly £2000 to each major town, the easternmost being Truro. 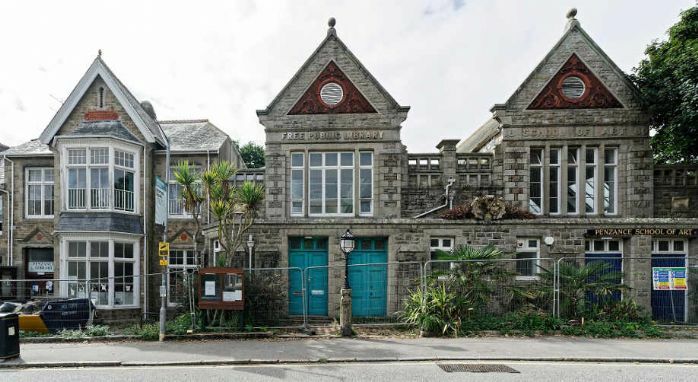 Penzance was the first of the five to establish and open its Library – probably because it was able to re-use an existing building, the Art Museum between the School of Art and Science. The proposal had been put to the ratepayers, who had voted (although not as overwhelmingly as some would have hoped) to go ahead. They agreed to the levy of a penny rate, which would provide £176 every year – more than enough to run an effective library. So, on that damp October evening, the dignitaries walked back up the short hill, out of the drizzle, and into St John’s Hall. The room had been “beautified by numerous growing plants and cut flowers” and at the front of the gallery hung the names of chosen worthies: Shakespeare, Bacon, Scott, Tennyson, Carlyle, and Milton. For Mayor Julyan, the Library represented a bastion of civilisation. He was proud that “no town in England of similar size could boast such a building, with a School-of-art on the one side and Science schools on the other.” The new Library – complementing the free education on offer to all since the legislation of 1870 – would make Penzance “the first town in the County, morally and intellectually”. Mr Norman Garstin was – as we might expect - mindful of the old Art ‘Museum’ (or gallery), whose building had been adapted to form the new Library. Garstin regretted the loss of the gallery, but was pleased that the site had brought art and literature “so patly together”. He called the association between literature and art “a very close one” – and the new Library had, indeed, been decorated with “a most admirable series of enlarged photographs of the scenes and incidents of life about us”, which perhaps brought Science into the equation. The top of Morrab Road in 1893 constituted what was in effect a campus. The artillery and rifle volunteer bands were probably pleased to get back indoors out of the drizzle, and mop their instruments. Some might have complained that the shortness of the route gave no scope for a decent blow. Did they, and the volunteers lined up behind them, glance towards the balcony as they marched back up the steps on their way in? And if so, what did these military gentlemen make of the message displayed on a banner: ‘The pen mightier than the sword’? “It is not the property of the rich any more than the property of the poor” Leonard Courtney said of the Library, to applause. “The rich cover themselves with glory by giving to its wealth, but the poor have equal rights with the rich there; and I hope it will be said that the poor will enjoy and employ those privileges as fully, as completely—perhaps even more fully, than the rich” he continued, this time to “loud applause”. Or if, in our leisure, some book go to read. No doubt we shall find there whatever we need. But that there we shall find good company." The Cornish Telegraph had campaigned for the Library all along. 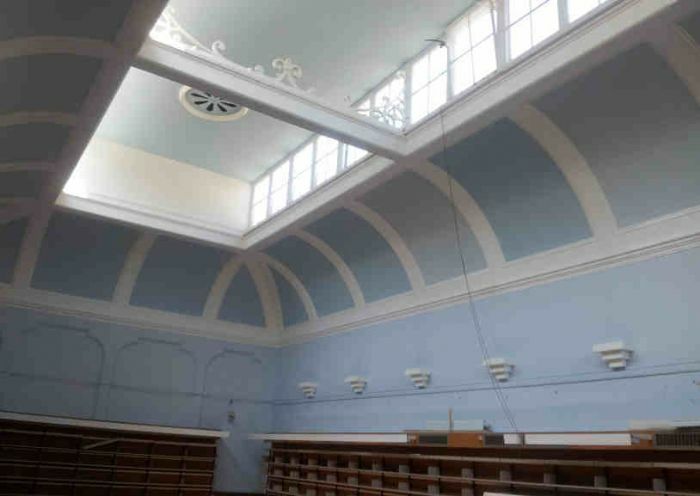 Readers were reminded of how the bills would be paid: “out of public funds for the public good”, the newspaper noted, and added a prediction: “As long as there are rates and ratepayers in Penzance, the doors of the Free Library will remain open, and its shelves will be stocked with books”. “It is a great thing to start well”, its editorial piece on the new Library would begin the following week; and “the free library has made a very good start indeed”. Ancient Spanish Ballads (accessed 12 9 2018) for Lockhart’s Ancient Spanish Ballads.